When potential homebuyers discuss designs with architects they wish to control the look and the feel of their new home. This is done with any number of design elements such as lots of windows or high ceilings. Load calculations allow the HVAC Contractor to study the building and determine the energy usage of each specific design element. 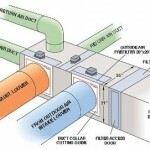 In this article we will discuss several major design elements that affect heating or cooling usage. 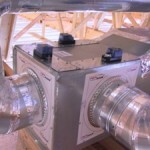 The HVAC Contractor can offer options that curtail this usage. 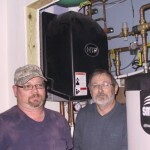 This makes the HVAC Contractor the driver of energy efficiency as well as comfort. In this position, the HVAC Contractor can offer alternatives that can profit the Homebuyer and make the HVAC Contractor more valuable to the builder. The conductive properties of windows. Using data acquired from many residential load calculations the building science community concludes that generally large holes in insulated walls called windows are the most concentrated place to loose or gain heat measured in Btu’s. We can calculate how many Btu’s are passing through a window so that we can determine the amount of heat that must be added or removed to furnish a comfortable temperature. Generally the window frames made from non-conductive materials such as molded fiberglass are much more efficient than frames made from conductive materials such as aluminum. 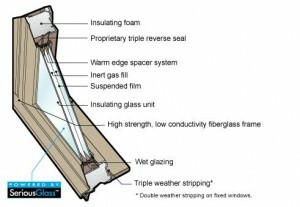 Another feature of fiberglass frame windows is over the life of the windows the expansion and contraction coefficient is much less which means they don’t crack or deteriorate like materials such as vinyl. This is important over time since cracks can mean air infiltration around the windows. The best way to retard the passage of heat is provide dead air space. Windows must remain as clear as possible AND trap air in a dead space. This is done by separating clear partitions in between the inner and the outer two panes of glass. Double panes will trap one layer of dead air, but when manufacturers can trap 2 or 3 or even 4 layers of dead air between sheets of clear film then even fewer Btu’s can pass through. In addition, the window manufacturers are using inert gas instead of air in the dead spaces between panes. The gas, such as argon or krypton is very stable (small amount of expansion and contraction). This is important so that the seal between the panes of glass does not break and let the inert gas escape. Also, this gas does not allow condensation between the panes of glass since there is no water vapor in the gas. The radiant properties of windows. Sun shining through glass is called radiant heat and only turns to heat when it hits something… the floor, the furniture. Radiant emittance through glass and solar reflectance are measured using infrared. The thermal emissivity, e, is a scale factor between 0 and 1, used along with temperature, to calculate Visible Transmittance though windows. VT is important because low values can increase the need for artificial light. There is almost no radiant affect through glass unless the sun is shining through it. Architects realize that window orientation is important and it grows in importance with the amount of glass facing east and west as well as large southern exposure. 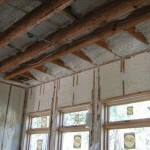 After windows, wall insulation is important. 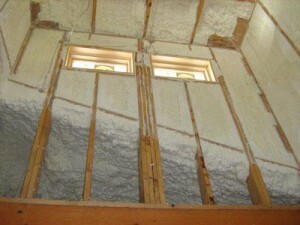 Insulation is nothing more than attempts to trap air in billions of bubbles in foam or control dead air in walls with non-conductive materials such as fiberglass, cellulose or other air trapping products. 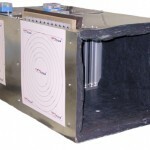 Rated as the R-value of the insulation, R represents a number that is the resistance to heat flow through a single layer of insulation, not the wall assembly. Also, R-value does not explain how infiltration affects different types of insulation materials that are rated similarly. So, the best insulation for walls is a package that includes caulk in the relatively small gaps including where the bottom plate connects to the floor as well as insulation material that traps air and does not allow the trapped air to circulate in the wall. Most homes breathe moderately. Since heat rises and cool air stays lower, most buildings will lose the heated air through the ceiling into the cool attic in the winter and draw that air from around a leaky bottom sole plate. In older homes we see a natural draft as much as two air changes per hour. In summer, extreme attic temperatures will create a strong draw through the soffit vents and outa ridge vent, gable vent or turbine ventilators. This draw can actually put a slight negative pressure on the ceiling and all ductwork located in or adjacent to the attic. This air movement represents a large infiltration load when calculated correctly. Building encapsulation eliminates this infiltration. Building encapsulation usually refers to applying open-cell polyurethane foam directly to the underside of roof decking between rafters and in all outside wall stud cavities throughout the framed structure. Along with the correct caulking package, this will essentially create an air encapsulation of the home that is so tight all gas appliances must bring in their own combustion air. Also, because the attic is now located inside the insulation envelope attic temperatures are no more than 10 degrees above the conditioned room temperatures. A side benefit is the attic space is now usable storage space. Because we are eliminating many points of infiltration, this insulation package (along with good windows that are installed correctly) can dramatically change the amount of Btu’s that move through the envelope by as much as 50%. Also, encapsulated structures are less dusty, and the temperature difference from upstairs to downstairs is not as large especially in extreme weather conditions. To recap, HVAC load calculations furnish the HVAC Contractor with the amount of Btu’s required to maintain comfort in the new home. This is accomplished by accumulating building measurements and automatically calculating building performance with time-tested formulas using weather data from the building locality. The calculations will automatically include expected infiltration rates and heat from people and appliances in the home. This tool in the HVAC Contractor’s hands is one of the supporting documents that will convince builders and homebuyers that he is the right installing HVAC Contractor for their building because he supports his equipment sizing decisions with sound building science. 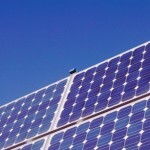 In addition, he can offer suggestions that will save energy dollars, give good return on investment and profit all involved.